Leadership: Who is allowed to lead change in your organization? Is it just managers or is anyone allowed to initiate a change program? Management: What are managers expected to do? How are they expected to behave? Are they elected by staff? Org Structure: Is there a hierarchy that shows importance and power? Roles: Do people have clearly defined roles that limit how they can contribute? Can people easily create new roles to meet new business needs? Systems: Are these chosen to serve business needs or to reduce costs and standardize? How do they enforce or limit behaviours? Policies: What rules do we have for people? How much do we trust them to make good decisions on their own? Processes: Are our processes designed to support the needs of customers and staff? How much process (rules) do we need? In what areas? Unwritten rules & norms: What are the sacred cows and taboo subjects? What is acceptable behaviour? Identity: How do we see ourselves in relation to the organization’s purpose? Values: What are the stated values? How well does this reflect what actually happens? Behaviour: What we say and do is the most concrete manifestation of culture. How we think about ourselves and our organizations will show up in every single meeting. Not only in how it is conducted, but in what is noticed and what people choose to say (or more importantly not say). The arrows linking the elements illustrate that they are all inter-related and connected. It is a web of cross-linking and supporting elements. 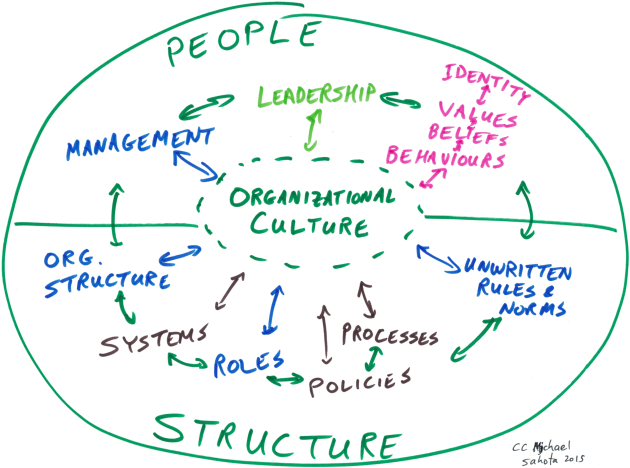 The web they weave together defines the organizational culture. Note that the above diagram is illustrative rather than an exhaustive list. For example, we may note that elements such as office structure could be added. The Laloux Culture Model provides a holistic view of culture that encompasses all of the elements shown above (and more!). In his book, Reinventing Organizations, Laloux makes a clear link between these elements is shown. We cannot shift behaviours without shifting the systems we use. This link was also noted in a 2003 journal paper: Systems and Culture: Connecting the Dots. In contrast, many models of Culture only use some of these elements. For example, the Schneider Culture Model uses a very specific set of filters that examine what is valued by an organization. This is great for building awareness and starting a discussion around culture, but not as useful for identifying a holistic plan for changing it. Effective and lasting culture change requires that all of these elements shift together. Teaching people new behaviours or beliefs – such as collaborative meeting techniques or how to assume responsibility – will not work in isolation. Neither will changing our systems and processes without other changes. For more on culture change, please see Culture Change: Reinventing Organizations. Introducing change efforts such as Agile with teams without changing all the organizational elements around it will generally fail to achieve the desired results. Whole Agile is one of several models to propose a holistic change model.